Gina St. Clair is putting her money where your mouth is. 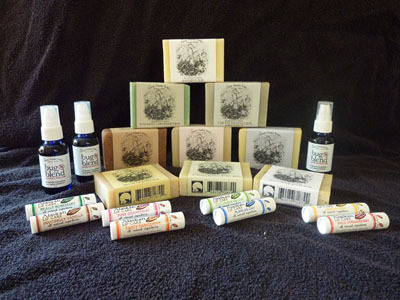 The energetic mother of three also is the founder of the Great Alaskan Soap Company. Her main product, which is sold in several businesses around Haines, is Alaskan Lip Care. The Jackson, Wyo. native moved to Haines in 1997 from a teaching job in King Cove. She started making the flavored lip balm in 2001. Following an initial success at the Christmas bazaar, she decided to give the business a real try. "I borrowed seven hundred dollars from my daughter, and walked around Skagway, Juneau and Haines to sell lip balm," St. Clair said in a recent interview from her kitchen, where she was filling lip balm tubes with a medicine dropper. St. Clair makes soap and insect repellant, but her lip care is clearly the backbone of her company. The balm comes in eight different flavors, including Wild Strawberry, Pink Grapefruit and Cucumber Melon, which St. Clair said is her biggest seller. The lip salves are all-natural, made of a base of sweet almond oil, beeswax, and shea and cocoa butter, with a touch of vitamin E as a preservative. Flavor extracts or essential oils create the array of scents. Rainbow Foods in Juneau is one of St. Clair's largest retail outlets. Owner David Ottoson said that the lip balm is a "continual seller." Ottoson estimates they sell around two-dozen tubes a month. "We like that it's made in Alaska. It's a really nice lip balm, and all the flavors sell really well." Ottoson said that he likes the smell. "I like the vanilla; it smells good enough to eat." Nelle Greene, grocery manager at Mountain Market, said the balm is a popular seller. "We keep re-ordering it. It's popular with tourists because it's a local product." St. Clair said that almost her entire business is Internet based. "Everything comes off the Internet. I get essential oils from the Midwest, tubes from California and display stands from Canada. It's really cool." St. Clair currently produces about 2000 tubes of lip balm, but her business has taken a jump following the recent Wholesale Alaska Gift Show in Anchorage. St. Clair picked up six new retailers in Seward, Cordova, Juneau and Glenallen. The initial order is for five hundred more tubes, but St. Clair hopes this is a beginning that might result in a total annual production of as many as ten thousand tubes. Currently, the business pays for materials, travel and advertising, but St. Clair said she should turn a profit this year with the new orders. Despite her current success, it hasn't always been smooth sailing for Alaskan Lip Care, which started out as Kisser Care. "I loved that name and tried to trademark it, but I found a company in Florida with almost the same name, so I had to come up with something different." She added that her techniques have evolved over the years as well. 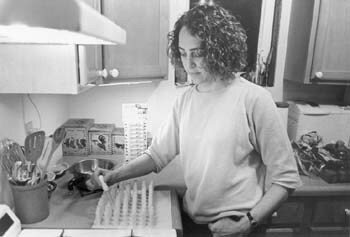 She has worked on new melting and measuring techniques that have improved her productivity. Advances in packaging have made the biggest impact on her sales. "You've got to get to a finished product. Packaging is 90 per cent." St. Clair is planning an addition to their house to give her more production room, and one day she'd like to be able to pay some employees. She currently donates ten cents from each tube to the Juneau Family Birth Center. St. Clair homeschools her two older children, Jackie and Casey, from three to five hours a day. She guesses that her children will probably be more involved in the business one day, but right now "they help by being really good when I need to work," she said with a laugh. St. Clair acknowledges that her business is growing, but she keeps her priorities in focus. "This could go as far as I want to take it, the sky's the limit, but I am intentionally growing my business slowly. My first job is as a mom. I don't want to be making soap and lip balm five days a week."